Your type of injury depends on the circumstances of your car accident accident. Attaining compensation depends on proving to the court the amount of losses you have incurred. 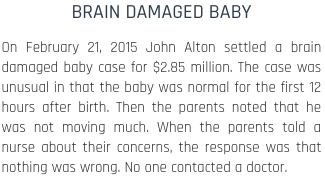 The Law Offices of John M Alton Co, LPA will fight to prove that your losses are of great value. I will fight for your right to obtain just financial compensation for your pain and suffering. At The Law Offices of John M Alton Co, LPA, I will make sure that every effort is made to push your car accident case forward aggressively. Your car accident case will be given top priority. In the unfortunate event that you are hurt in a car accident accident, or someone close to you is injured or killed, it is important to call on a dependable, local lawyer and firm like The Law Offices of John M Alton Co, LPA for help. Medical expenses, wage losses and other financial issues are certain to follow after a car accident accident happens to you. I am here to assist you in Columbus and the surrounding areas today. 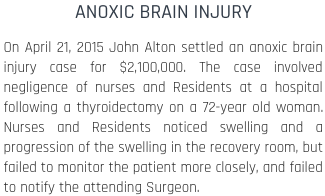 The Law Offices of John M Alton Co, LPA will find you the appropriate resolution to your pain and suffering in a court of law. You should be compensated financially for any suffering you have endured due to your car accident issue. If someone has been negligent to you or caused harm or distress; I am here to assist you with all my effort. 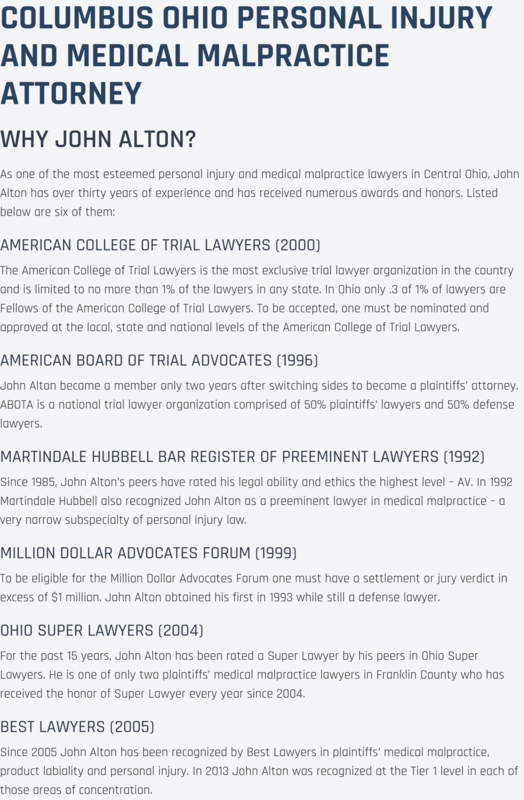 Here at The Law Offices of John M Alton Co, LPA, our lawyers in Columbus have experience handling various car accident cases. We can provide you with the help you need. Call us at (614) 221-6751. Also, feel free to visit our offices at 1071 S. High Street.